International trade figures heavily in the presidential race. Presidential candidate Donald Trump said, "Hillary Clinton unleashed a trade war against the American worker when she supported one terrible trade deal after another - from NAFTA to China to South Korea." And adding, "A Trump Administration will end that war by getting a fair deal for the American people. The era of economic surrender will finally be over." He lamented, "Skilled craftsmen and tradespeople and factory workers have seen the jobs they love shipped thousands and thousands of miles away." Hillary Clinton has offered her own condemnations of trade and globalization. Some see her stance on trade as little more than typical campaign rhetoric. Bill Watson's Reason magazine article "Hillary Clinton's Protectionist Promises Would Do Serious Economic Damage," looked at Clinton's trade agenda. Watson concluded that for "fans of free trade and globalization, Clinton is a much more appealing candidate simply by not being horrible." It is true that the number of manufacturing jobs in the United States has been in steep decline for almost a half-century, but manufacturing employment disguises the true story of American manufacturing. U.S. manufacturing output has increased by almost 40 percent. Annual value added by U.S. factories has reached a record $2.4 trillion. To put that in perspective, if our manufacturing sector were a separate nation, it would be the seventh richest nation on the globe. 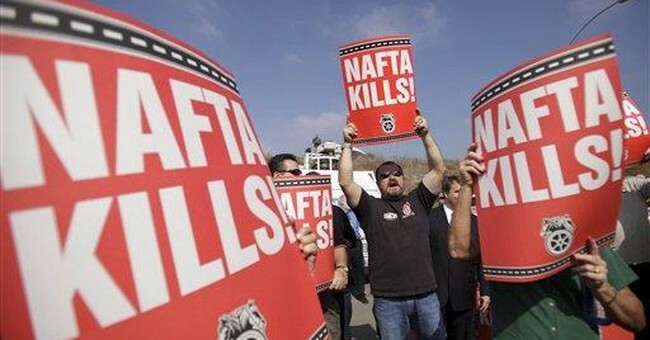 Daniel Griswold's Los Angeles Times article tells the story: "Globalization isn't killing factory jobs. Trade is actually why manufacturing is up 40 percent." Griswold is senior research fellow and co-director of the Program on the American Economy and Globalization at George Mason University-based Mercatus Center. He says what has changed in recent decades is that our factories produce fewer shirts, shoes, toys and tables. Instead, America's 21st-century manufacturing sector is dominated by petroleum refining, pharmaceuticals, plastics, fabricated metals, machinery, computers and other electronics, motor vehicles and other transportation equipment, and aircraft and aerospace equipment. Griswold suggests that political anger about lost manufacturing jobs should be aimed at technology, not trade. According to a recent study by the Center for Business and Economic Research at Ball State University, productivity growth caused 85 percent of the job losses in manufacturing from 2000 to 2010, a period that saw 5.6 million factory jobs disappear. In that same period, international trade accounted for a mere 13 percent of job losses. Manufacturing job loss is a worldwide phenomenon. Charles Kenny, writing in Bloomberg, "Why Factory Jobs Are Shrinking Everywhere," points out manufacturing employment has fallen in Europe and Korea and "one of the largest losers of manufacturing jobs has been China." While job loss can be traumatic for the individual who loses his job, for the nation job loss often indicates economic progress. In 1790, farmers were 90 percent of the U.S. labor force. By 1900, about 41 percent of our labor force was employed in agriculture. Today, less than 3 percent of Americans are employed in agriculture. What would Donald Trump or Hillary Clinton have done in the face of this precipitous loss of agricultural jobs? They might have outlawed all of the technological advances in science and machinery that have made our farmers the world's most productive and capable of producing the world's cheapest food. There's one thing to keep in mind. Losing a job due to outsourcing or losing it to technological innovation produces the same result for an individual: He's out of a job. The best thing that we can do is to have a robust economy such that he can find another job. History suggests another alternative to those concerned about manufacturing job loss. The Luddites were 19th-century English textile workers who protested against newly developed labor-saving technologies. They went about destroying machinery that threatened to replace them with less-skilled, low-wage laborers.